Over the last few days we've been working on our ornaments to go with our fourth advent book, The Little Fir Tree by Margaret Wise Brown. This book is SO beautifully illustrated it's almost breath-taking. It is a really sweet story as well. I love pretty much everything written by Margaret Wise Brown and it seems that every year or so I discover something else she's written. We have owned this book for a few years. The first time I read it to my oldest son he was quite teary and touched by it. I won't spoil it by telling you why........you'll have to read it yourself. 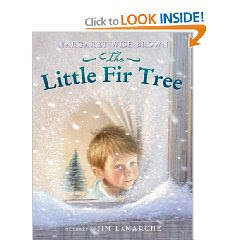 We made pinecone Christmas trees to go with this book. I was loosely basing them on something I'd seen online, but we kind of did our own thing too. During the snowstorm on Tuesday I gathered some pinecones from one of the trees on our property. Then the boys helped me paint them green. 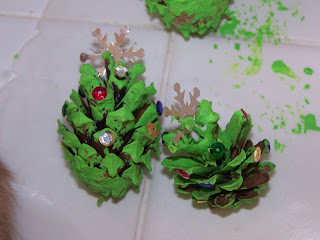 I only had lime green paint and kind of wished they were darker, but they will show up well on a darker green tree. 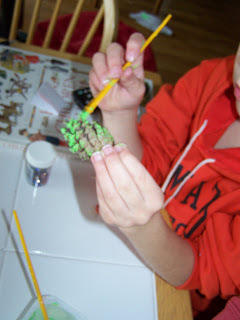 Below you can see my oldest son painting a pinecone. After the paint dried we (I) glued sequins on to make little ornaments on the teeny tree. It is pretty hard to handle such tiny sequins. 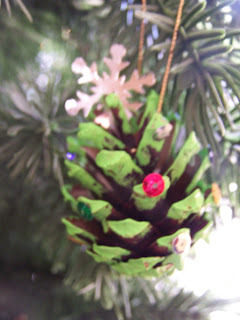 I ended up putting a dab of glue on the pinecone and then picking up the sequin with the glue. The boys were both excited to find some snowflake sequins (there were only 2) and we used those for the "stars" on two of the pinecone trees. I tied some very thin gold cord around the pinecones to hang them. 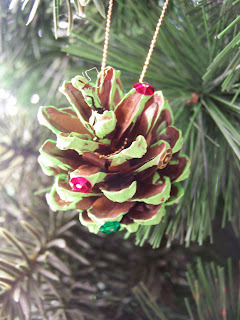 We made glittered pinecones last year and the hangers fell off some of them. This time I tied the cord around the pinecone and put a dab of glue on the knot. Then I used the long ends to tie another knot to make a hanging loop. I also put a dab of glue on that knot. I really like this craft! Awesome, thanks for sharing!! Very cute! Wow! i love these so much! so much time and effort involved in making these though? I went for a much simpler design, think I used far too much glitter? what do you think? Party in the coop tonight! !